Can i say "我知道你"? Which one is more used? These words are used differently. You cannot use 知道 here. 认识 is to know about sb/sth from several aspects, or to a certain depth. He knows how Egyptians built pyramids. 认识 also means to learn but 知道 doesn't. Let's learn how Egyptians built pyramids. It is also like Conocer VS Saber in Spanish. 知道 means "to know, to be aware of." So it can't be used in this case. 认识 may also mean "to know, understand, etc." But it also means "to meet (person)." So it should be used in this case. 知道 refers more to 'information based' knowledge, like knowing a phone number or a fact etc. I am a bit confused. 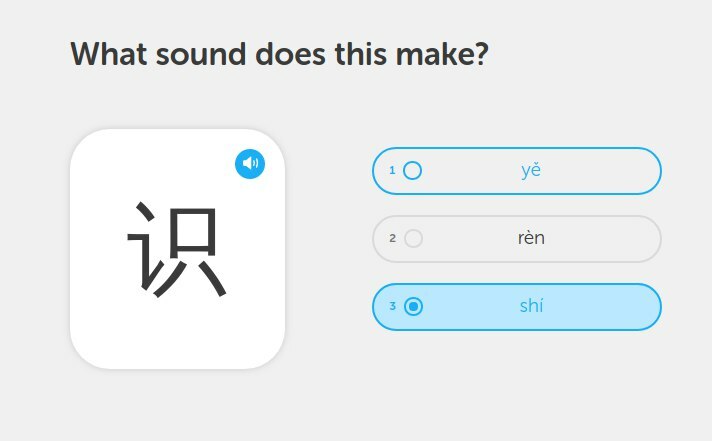 Google Translate marks and reads 识 in 4-tone, but on all Duolingo cards, it is marked as 2d tone.. Maybe I am wrong, but please, tell me, which tone is required here. Also, I found an answer. The character in your screen is 识, not 认.
why dont we say 我很认识你 instead. Can't “我认识你” also be translated as "I recognize you?" Doesn't 认识 also mean 'meet'. As in the earlier example of "nice to meet you?" 认识 does not mean Meet. That sentence as I recall was It is nice to meet you (or It is nice meeting you) vs. 很高兴认识你 , for which Duo preferred the approach of using situational conversation instead of the usual word-by-word literal translation. The words used were not equivalents.